In a group of people, there will always be one person that stands out. In Hogwarts School of Witchcraft and Wizardry that is definitely Filius Flitwick. Filius Flitwick is a pure-blood wizard that teaches Charms. But there is much more than meets the eye with this guy. Filius isn't a pure wizard, he is half goblin - half wizard. To be exact, he is human but he has a Goblin antecedent (he just looks shorter than others). This guy is really something. He maybe doesn't look scary or serious like other great professors, but he is one of the most capable wizards there is. By knowledge, he is probably second best, behind Dumbledore. When he attended Hogwarts in his early years he showed a lot of potentials. He was sorted into Ravenclaw, the witty and the wise. It took Sorting Hat a little under 5 minutes, almost making him a Hatstall. He aced every class like a champ and immediately became a model student. Many of his peers couldn't take him seriously because of his looks, but when it came to dueling, he showed his full arsenal. After beating one opponent after another he soon became a Duelling Champion, stacking trophies along the way. When he was in his senior year, meaning the 7th year at Hogwarts, he also received a high Nastily Exhausting Wizarding Test grade in Charms. But he didn't stop there. Even after his graduation, before he started to teach at Hogwarts, he was still learning and practicing other sorts of Magic. He became a master in almost every class. Even learning the few non-verbal spells that are extremely difficult. He was also a brilliantTransfiguration user and even better at Defenses Against the Dark Arts. In the end, he learned so much because he wanted to teach and transfer his knowledge to other willing students. He started teaching at Hogwarts in the early 1970's. In year one you will mostly see him in the Potion Classroom. Chapter 4: Your protagonist will ask Professor Flitwick to meet him outside in the Courtyard, where they will start negotiating if you are ready to learn a dueling spell. Finally, after arguing for a brief moment, Professor Flitwick will agree to teach you, but only so you can defend yourself. Chapter 5: in this chapter, Filius Flitwick will catch your protagonist having an unallowed duel with Merula Snyde in the Courtyard. There they will ask you who cast the first spell in order to figure out who to blame. Professor Filius Flitwick will continue to be your Charms teacher in the second year. 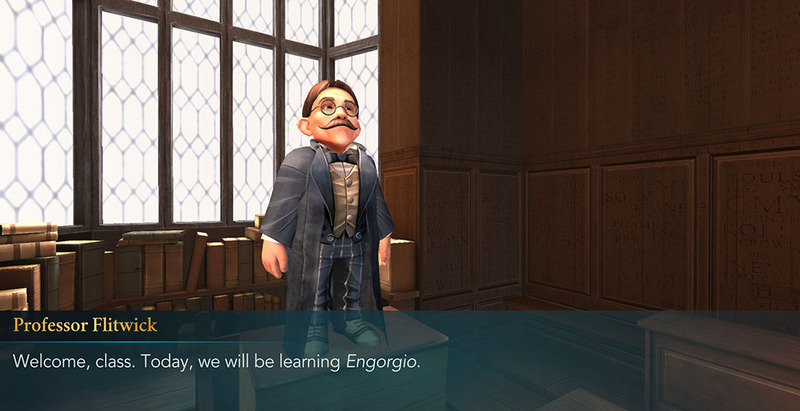 However, this time you will learn less charm spells and focus more on transfiguration, which is why Flitwick will only appear for two lessons in this year. Chapter One: The first spell Professor Flitwick will teach you is Engorgio. This charm can be used to enlarge the physical appearance of an object or a living being, however, Professor Flitwick strongly discourages the latter. Ever after being warned you will later use this spell to complete one of the objectives in the game. Luckily, there was no incident. Chapter Two: The other spell Professor Flitwick teaches you is Reducio, which is necessary in order to complete your plan of sneaking into Slytherin’s Common Room and retrieving the Black Quill. Once again, Professor Flitwick warns you against using the spell on yourself, but in vain.